This unsigned instrument bears some resemblance to the compendia of Christoph Schissler but it is constructed and decorated in a cruder form. It has many similarities to another unsigned German instrument (Epact 72560). 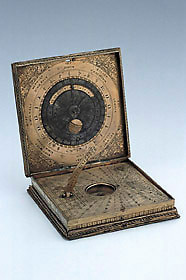 The compendium has a compass and horizontal string gnomon sundial, adjustable for latitude, as well as lunar and horary volvelles and a table for the latitude of places. On the base is a horary quadrant illustrated with engraved images of instruments in use for astronomical observation and display, and for surveying.